The SCIO-Indigo is an incredibly comprehensive system based on the science of quantum physics. It is a state-of-the-art Evoked Potential Bio-Feedback System that scans bodies, just like your virus protection software on your computer, looking for vitality-robbing culprits. It tests your body for 10,000 items including but not limited to vitamins, minerals, hormones, pathogens, emotions, color therapy and more. The Quantum Biofeedback Device is connected to the client via a head strap, wrist and ankle bands. Scio-Indigo devices are being used worldwide by Doctors, Kinesiologists, Dentists, Veterinarians, Naturopaths, Chiropractors, Homoeopaths, Acupuncturists, Nutritionists, Psychologists, Hypnotherapists, Massage Therapists, and other health practitioners. How can the Quantum Biofeedback help my health issues? The SCIO-Indigo works by evaluating and rebalancing stressors in the body that have developed over the years – all types of stress – physical, mental, emotional or structural. Research states that stress accounts for 90% of all illnesses. If the stress is not addressed, it can manifest itself as digestive disorders, allergies, hormonal imbalances, skin conditions and degenerative disorders such as cancer. When the body begins to adapt to the stressors, degenerative disorders start to develop. Biofeedback can identify these stressors BEFORE they become an issue and help the body in cleansing and rebuilding. Most importantly, biofeedback does not treat symptoms but addresses the root cause of the imbalance. Often the cause is emotional and by using the neural-emotional therapies the underlying cause of the imbalance is addressed. These changes are more powerful than affirmations as they erase the old memory tapes and replace them with new positive growth intentions. I have seen shifts in myself and my family in just 6 days!!!! Clients who do a combination of Quantum Biofeedback and Geotran work change and progress more rapidly to be the best they can be! What can you do for my son with ADD? We do not want to put him on medication. ADD/ADHD is our specialty. Louise taught special education for 20 years and then became like the students she taught. She healed herself from ADD naturally using diet, environmental controls, detoxing, biofeedback, organic foods and natural supplements. 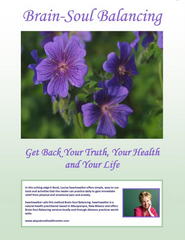 She teaches local workshops and webinar courses on healing ADD/ADHD naturally and is available for consultation. See upcoming events. The use of Quantum Biofeedback balances the brain waves and addresses the stressors that are keeping the body “out of balance” (food allergens, pathogens, food additives, emotional stressors and more). The Quantum Biofeedback creates a feedback loop with the individual balancing these stressors. Many of the movers and shakers of our world have been diagnosed with ADD or ADHD. Michael Phelps, the winner of seven Gold medals in the 2008 Olympics was diagnosed with ADD at the age nine. Albert Einstein supposedly had ADD before we began labeling it. These individuals are very gifted and talented and we need those skills and abilities to be put to good use for our families and society as a whole. We enjoy helping these individuals become healthy and balanced and focused. Ask about or subspace sessions and special packages for kids. Contact us for details on a plan of treatment click here. What is Kinesiology (Muscle Response Testing) and how is it used? Muscle response testing helps establish the cause of imbalances in the body and can be used to test nutritional and enzymatic points, allergies and even emotional issues. We use kinesiology to test the muscle response during the Geotran integrations. Louise also teaches muscle testing and dowsing in the Hanna Kroeger classes to empower you to take care of yourself and your families. Anyone can learn, even children. What is involved in Lifestyle Coaching? We guide you in making healthy choices for you. We come up with a plan together that you can implement with our support. The plan may include nutrition, exercise, setting healthy boundaries, environmental changes and awareness, and stress reduction tools that work for you. I need help with nutrition and diet. Can you help with this? Yes, we help design a specific plan for you. We take into account many factors including allergies and sensitivities, blood type, metabolic type, activity and ease of food preparation. We have a Metabolic Typing diet that prints out a one page diet listing the foods in groups that are appropriate for your individual metabolic type.